A mediastinoscopy is a procedure performed in the operating room in which a tube (a mediastinoscope) is inserted through the chest wall to examine the area between the lungs (the mediastinum). It is done to help determine the stage of lung cancer, and proper staging, in turn, is critical in selecting the best treatment options for the disease. The mediastinum contains the heart, the esophagus, the trachea, lymph nodes, and blood vessels. During this procedure, doctors are able to look for tumors or enlarged mediastinal lymph nodes and take samples (biopsies) to look for cancer or other conditions. In the past, this procedure was often critical in properly staging a cancer to determine the best treatment. Now, PET scans and endobronchial ultrasounds can sometimes provide this information in a less invasive way. Why is a Mediastinoscopy Done? A mediastinoscopy is recommended most often as a method to help determine the stage of lung cancer, to see if, how far, and to what regions a cancer may have spread. An accurate understanding of the stage of a lung cancer is very important in helping doctors recommend the best options for treatment. A mediastinoscopy may also be done to diagnose and/or other conditions, such as sarcoidosis, lymphomas, and tumors of the thymus gland. As imaging tests improve for staging lung cancer, other techniques may replace mediastinoscopy, at least for some people. The most common test which is done as an alternative to this procedure is a PET scan. A PET scan looks at your lungs in a scan similar to a CT scan but is based on an entirely different method. Unlike a CT scan which looks for structural changes in the lungs, PET scans look for functional changes. Cancers which are actively growing will usually light up on a PET scan, whereas a scar (which can look similar to a cancer on CT) will show up as not actively growing. When is a Mediastinoscopy Done? A mediastinoscopy is usually done when a surgeon believes that a person has lymph nodes in the mediastinum that are positive. The presence of mediastinal lymph nodes plays a role in staging a lung cancer, and since having an accurate stage is important in treatment, can play a large role in choosing the most effective treatments. Mediastinoscopies are done less often than in the past. As noted above, a PET scan can sometimes provide the same information but with a much less invasive study. The combination of bronchoscopy with an endobronchial ultrasound (and biopsy if needed) can also sometimes replace the need to do a mediastinoscopy. Before ordering your procedure, your doctor will talk with you about the risks of the procedure, and what she may expect to learn by doing the test. If you are on any medications such as the blood thinner Coumadin (warfarin), aspirin, or anti-inflammatory medications such as ibuprofen, she will recommend that you discontinue these for a period of time before the procedure. It is important to let your doctor know if you are using any herbal remedies or nutritional supplements since some of these can also increase your risk of bleeding. Before the procedure, you will be asked to “fast,” that is, not eat or drink anything (even water) for several hours. When you arrive at the hospital, a medical professional will ask you several questions and place an IV (intravenous line) in your arm. He will also fit you with monitors so that your heart rate and blood pressure can be monitored throughout the procedure. The physician performing the procedure will visit with you to discuss the test and its risks, and ask you to sign a consent form. The anesthesiologist will also ask you questions about your history of anesthesia, any problems your family members have had with anesthesia, and discuss the anesthesia you will be given. In the operating room you will be given a general anesthetic, and, after you are asleep, a tube will be placed in your throat to help you breathe. Your surgeon will make a small incision just above your breastbone (the sternum) and insert the mediastinoscope, a hollow tube with a light. He will then examine your mediastinum and take biopsies of any areas that appear abnormal. After removing the mediastinoscope, a few stitches or steri-strips (strips of tape) will be applied to close the incision. What Can You Expect After Your Mediastinoscopy? When you wake up in the recovery room you will be drowsy for a while from the anesthesia. You may have some discomfort in your incision, and it is common to experience some hoarseness and a mild sore throat from the tube. The recovery room staff will monitor you for several hours before allowing you to return to your hospital room or return home. If you will be going home following the procedure, you will be asked to have someone drive you, since the effects of the anesthesia can last for several hours. As with any medical procedure, a mediastinoscopy involves possible risks as well as reasons why the procedure should not be performed (contraindications). Bleeding: On occasion, further surgery may be required to control bleeding. A pneumothorax: A pneumothorax is “air leak” or “collapsed lung.” When this occurs, a chest tube will usually need to be left in place until the air leak has resolved. Persistent hoarseness ​may occur if the nerve to the vocal cords is damaged during the procedure. Infections: Infections may occur, and are more frequent if biopsies are taken during the mediastinoscopy. Complications related to general anesthesia. Aphonia: Aphonia refers to the inability to talk or created sounds (this is usually transient and goes away on its own). Perforation of structures such as the esophagus, trachea, and blood vessels that lie in this region. Neck problems: This may include current conditions involving the neck that could be worsened by changes in position or previous neck surgeries. Previous mediastinoscopy or surgery in this region (such as open heart surgery). Superior vena cava obstruction (a complications sometimes found with lung cancer or other conditions). Medical conditions, such as heart disease, that could be worsened by the surgery or anesthesia for the surgery. Following your mediastinoscopy, your doctor will set up an appointment to discuss the results. If a biopsy was taken during your procedure, it may take a few days for the lab to examine the tissue and send the results to your doctor. With lung cancer, the result of your mediastinoscopy can provide important information in determining the stage of your cancer. Determining an accurate stage for your cancer, in turn, is one of the most important steps in choosing a treatment plan that will work best for your particular tumor. You should call your doctor with any symptoms or concerns you have following your procedure. It is important to call your doctor right away if you experience any chest pain, difficulty breathing or develop a fever (usually over 100.5 F, but ask your doctor what he would recommend). 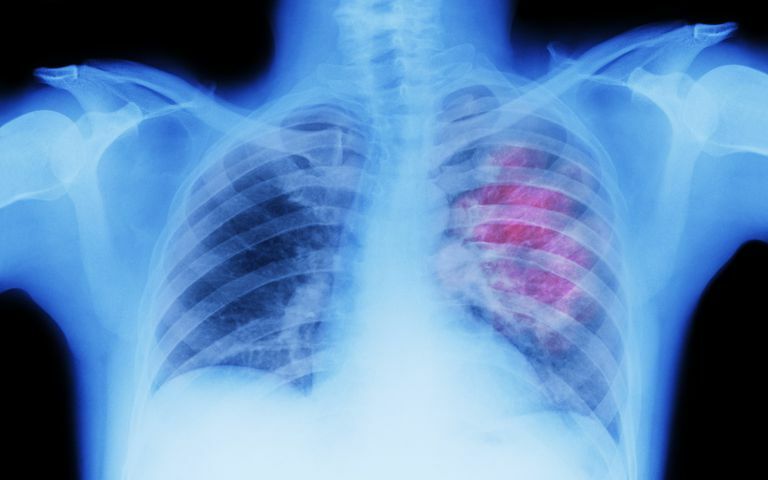 Staging a lung cancer is extremely important in selecting the best possible treatments. The lymph nodes in the mediastinum, however, can be difficult to evaluate. While PET scans and endobronchial ultrasound are replacing the need for some mediastinoscopies, the procedure is still often done in the initial work-up of a lung cancer. If you are having a mediastinoscopy, talk to your doctor about possible alternatives. Being your own advocate in your cancer care can help you feel more empowered, and can sometimes even play a role in your outcome. Velez-Cubian, F., Toosi, K., Glover, J., Pancholy, B., and E. Hong. Transient Aphonia After Mediastinoscopy. Annals of Thoracic Surgery. 2017. 103(6):e549-e550.